Using the 6-22-2008 build of Iometer I ran a 3 minute long 2MB sequential test over the entire span of the drive. The results reported are in average MB/s over the entire test length. Sequential read performance is a virtual tie across the board, the exception being if you have totally random data on a SandForce drive. In that case the Vertex 2 is noticeably behind the competition. Pair the C300 with a 6Gbps controller and it has a clear advantage - you get a 20% increase in sequential read speed from the C300. Sequential write speed is strong on the C300, but mostly if you look at the 256GB drive. 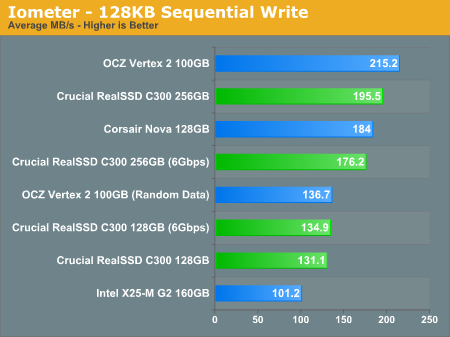 The 128GB C300 is 30% faster than Intel’s 160GB X25-M G2, but no where near the peak speed of OCZ’s Vertex 2. The random data test has the Vertex 2 and C300 a lot closer, but in reality I’d expect the Vertex 2 to be a bit quicker than the 128GB C300 in sequential write speed. 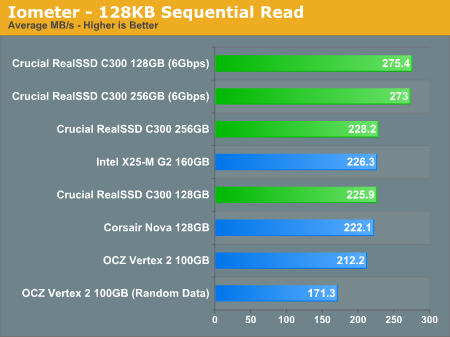 The 256GB C300 should be at least as fast as the Vertex 2 in practice, if not faster. Once again we see the odd situation where our 256GB C300 paired with a 6Gbps controller actually drops performance a bit here. There must be a driver optimization issue with 4K aligned, 128KB sequential writes because the same problem doesn't present itself with unaligned 2MB sequential writes. Unfortunately for Marvell/Crucial, this test is more representative of how modern OSes write sequential data. Looking at our synthetic tests alone it seems that the C300 is very competitive with SandForce. It boils down to the workload more than anything else. The C300 is clearly in the run for first or second place. After reading Anand reviews on the c300, i was amazed by the performance of the drive even for the 128gb model and since i have a Rampage III gene with a 6gb Marvell 9128 controller i was thinking of buying one. Finally 3 days ago the drive was 250$ on newegg so i bought it. Going around on forum i discover with great disappointment that the 6gbs Marvell controller "apparently" don't issue the TRIM command, is it true ? Nobodies seem to have a definitive answer, Crucial don't have one, Marvell are under NDA so they don't answer anyone, Asus Told somebody that they should use the Intel controller instead to ensure TRIM support. 2- Some Claim that with the latest Marvell driver which is 1.0.00.1051 make the TRIM working. Some claim that it don't. 3-Other claim that the Microsoft ACHI drivers instead of Marvell's one work with TRIM. It would be very nice if you Anand could test that particular scenario (C300 With Marvell 9128 6gbs windows 7 64) To see if the TRIM command work. In the end not only me will benefit, but the whole community as well.